President and Mrs. Kennedy land aboard Air Force One at Love Field in Dallas, Texas at 11:40am Local Time. Preparing to seek reelection in 1964, the President headed to Texas to attempt to heal old wounds and bring stability to the state's Democratic Party. President Kennedy was meticulous in his approach and left no stone unturned. He understood his strong points and ultimate asset in the game -- his beloved wife, Mrs. Jacqueline Kennedy. America had fallen in love with her, so the President ensured to put her on display in Texas. Mrs. Kennedy had been out of the public eye since the death of their son Patrick Bouvier Kennedy, in early August 1963. This was the President's moment to use Jackie to his advantage and make her shine. 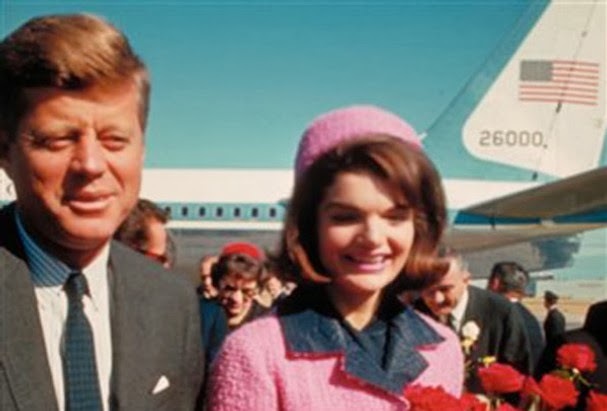 Departing Air Fore One at Love Field, the President ensured to take advantage of the eager press and media on site, letting Jackie depart Air Force One first, in that beautiful iconic pink Chanel suit. The cameras ate it up. Then came the President, looking dapper, confident, healthy, tanned and very iconic in his own way. 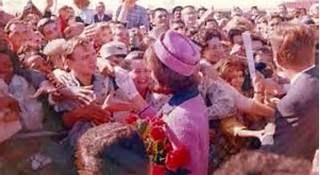 The crowd at Love Field gave the President and Mrs. Kennedy such a warm and cheerful welcome, President Kennedy became consumed and in the first of a series of unplanned missteps, diverts from plan and decides to greet the well wishers on the field. Prior to this while awaiting the President's arrival at Love Field, a young Jim Lehrer (PBS News Hour) who was a Dallas reporter then, on a question asked by his newsroom, asked a secret service agent on the ground if the bubble top on the President's limousine would remain on, during the Presidents transport through Dallas. At that point that agent checks with another agent on the weather conditions in downtown Dallas. Then, that very agent whom Lehrer had asked about the top, then tells another agent "take the bubble top down." Finally the President eases the nerves of his Secret Service agents and he and Mrs. Kennedy get into their limousine. At 11:55am (CST) the motorcade departed Love Field enroute to the Dallas Trade Mart, through downtown Dallas. The President's motorcade route was printed in local newspapers, so everyone had full knowledge of all the intricate details. Enroute the President is tempted again and made his second unplanned mistake. Upon seeing a group of school children holding signs that asked him to stop and greet them, the President ordered the secret service driver to stop the limousine and pull over, so he could greet the children. The children and adults accompanying them approached the limousine and shook hands with the President, then the motorcade proceeded on. A short moment later, the President ordered the driver to stop the limousine again, this time another group of school children with their catholic nun accompanying them. Again, greetings took place, then the limousine proceeded to continue on the route to the Dallas Trade Mart. The crowds continued to cheer as the motorcade travelled through downtown Dallas. At one point Nellie Connally (wife of Texas Governor John Connally - whom accompanied the President through Dallas in the limousine) turned around and said to the President "well, Mr. President, you can't say Dallas doesn't love you." 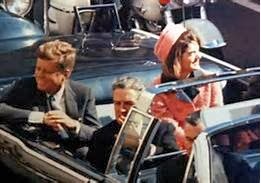 A few second later, with just five minutes remaining on the route before the President would arrive at the Dallas Trade Mart, the motorcade turned on to Elm Street, Dealey Plaza was in clear sight and the Texas School Book Depository. At 12:30pm (CST) local time, three shots were fired. Panic and chaos ensued. The President was hit, as well as Governor Connally. The limousine speed off to nearby Parkland Memorial Hospital. The President's motorcade arrived at Parkland Memorial Hospital to chaos and pandemonium. Mrs. Kennedy, in shock refused to let go of the President's body for transport into the hospital. Secret Service Agents pleaded with her. Finally an agent gave Mrs. Kennedy his suite jacket to cover the President, so his injuries wouldn't be visible to the public. The President was put on a stretcher and rushed into the hospital where a team began to work on him. Shortly after everyone entered the hospital, a secret service agent instructed a staff member of Parkland Memorial Hospital to clean the limousine's interior. Yes, I know the car was a crime scene and the evidence was being scrubbed away with soap and water. Smh. After the prompt clean up session, the bubble top was reattached and a secret service agent drove it back to Love Field and loaded it on the Air Force cargo plane for transport back to Washington, DC. Inside Parkland Memorial Hospital President Kennedy's body was placed in Trauma Room One under the care of a team, led by twenty-eight year old resident physician Charles Carrico. At this point President Kennedy was still alive, but having trouble breathing. A tube was placed down the President's throat to assist. Then with the assistance with other physicians, the team decided to perform a tracheotomy, further widening the bullet hole in President Kennedy's neck. This would later fuel conspiracy theories. We would then come to find out that a missing bullet was deemed lost due to this procedure, but later found in the hospital. The doctors in their shock easily missed it. The doctors then attempted to save the President's life. He was slowly slipping away. At the midway point, a nurse (I believe she was catholic as well) suggested that it was time to call a priest to administer the President his last rites. Mean while, Vice President Johnson was hidden in a storage closet in the hospital, by secret service. It's hard to imagine the limited technology of 1963. No cell phones, twitter; instant communication was non-existent. In the panic, everyone on the ground in Dallas seemed to be confused on succession protocol. I know, we all thought the Reagan administration were the first ones to mess up on protocol :) At that moment the duty of the secret service was to President Lyndon Johnson. Yes, President! Per Article II, Section I of the United States Constitution, at the moment the bullet hit President Kennedy's head, he was legally incapcitated, effectively making Lyndon Johnson the 36th President of the United States. Despite this Johnson knew he wad to walk a fine line and thread lightly. He was very methodical in his rise to power. When advised by secret service to promptly assume power and return to Washington, DC, Johnson rejected. Knowing full and well that every move and word going forward would determine if he entered the presidency with ease and the full backing of the American people or entered it with contempt, Johnson declared that he was not leaving Dallas without the President or Mrs. Kennedy. The last thing Johnson wanted to do, was piss off Robert Kennedy. Let's just say the pair were oil and water. Back in Trauma Room One at 1:00pm (CST), President Kennedy was pronounced dead. CBS News anchor Walter Cronkite delivred the historical heart wrenching news to the nation. Upon arrival back to Love Field, Lyndon Johson made a necessary phone call to Bobby Kennedy. He expressed his condolence and began to discuss the transition of power. (My favorite fun fact about this story) Bobby Kennedy didn't express this to Johnson during that phone call, but he later admitted that he didn't see the rush for Johnson to be immediatly sworn in as President and prefered that his brother return home to Washington, D.C. still as President of the United States, Commander-in-Chief. Meanwhile President Kennedy's body was still at Parkland Memorial Hospital and preparations were underway for his return to Washington, DC, but not before the State of Texas pulled one last trick out of its hat of bad news. According to Texas law, President Kennedy's body was part of a homocide investigation and therefore not permiited to leave the hospital before an autopsy was perfromed. The secret service team wasn't havent it and cuased a serious uproar. 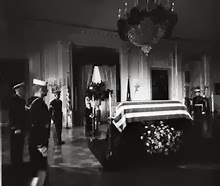 After it was all said and done, no autopsy was performed in Texas and the Kennedy entorage made their way out with Kennedy's body lying in a casket. At approximately 2:00pm (CST) President Kennedy's body departed Parkland Memorial Hospital and was driven back to Love Field for return to Washington, D.C. abroad Air Force One. Upon arrival to Air Force One, secret service agents had difficulty getting the casket through the aircrafts main door. They resulted to removing the handles on the casket and manually lifting it up the stairs and into the aircraft. I recently saw a movie that depcited this scence as secret service agents having ease carrying the casket through the door, but removing seats in Air Force One to lay the President's casket comfrotably. I'm leaning toward the handle story since I heard this story told by the actual sercet service agent on duty. 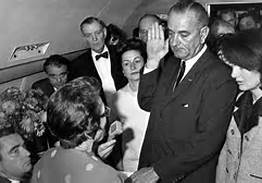 Shortly before Air Force One departed Love Field for Washington, D.C., at 2:38pm (CST), Vice President Lyndon B. Johnson was sworn in by federal district court judge Sarah Hughes, as the 36th President of the United States. Air Force One would land at Andrew's Air Force base at approximately 6:00pm (EST). President Kennedy's body was transported to Behtesda Naval Hospital in Bethesda, Maryland. Mrs. Kennedy was admant about bypassing the autopsy process. She felt it wasn't necessary. Secret Service and Aides convinced her to comply on the basis that her husband had been the victim of a crime. Mrs. Kennedy selected Bethesda Naval Hospital because of the President's background in the Navy. Many conspiracy theorist question this decision and wonder if it was a decision truly made by Mrs. Kennedy. The more practical and wiser choice would have been Walter Reed Army Medical Center. Gunshot traumas are more prevelent in the Army than the Navy. At midnight the tragic day finally came to an end. President Kennedy's autopsy was completed and preparations were underway for his funeral that took place on Monday, November 25th, 1963. 1 -Where were you when President Kennedy died? 2- Do you believe any consipracy theories surrounding the death of President Kennedy? 3- What would America look like today, had President Kennedy lived? 4- Share any interesting facts you know about those four day in November 1963. Happy Thanksgiving from the Urban Politico! Iran Sanctions Deal: Good for US or not? Is George Zimmerman the New OJ? Twitter's IPO: To Buy or Not To Buy?